Are you wanting to get the most for what you found or don't want any longer?. No Collection is to large. I don't like to wait and you shouldn't either. Signature Confimation will be required. Item is in Fine Condition. Item is missing both Laser gun and Missile Launcher. Item was bought in a estate sale and will be sold as it was found. Lighting will make images appear different. Transformers G1 VINTAGE 1985 Dinobot Slag Hasbro Tech Specs File Card C-6 Cond!! This is a 100% authentic original Slag Dinobot Flamethrower Tech Specs file card from Hasbro's legendary G1 line in 1985! Card is in good C-6 condition with no folds or tears. Truly a piece of toy history! I always combine shipping on multiple items! 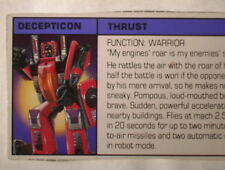 This is a 100% authentic original Thrust Decepticon Seeker Jet Warrior Tech Specs file card from Hasbro's legendary G1 line in 1985! Card is in good C-6 condition with no folds or tears. Truly a piece of toy history! I always combine shipping on multiple items! 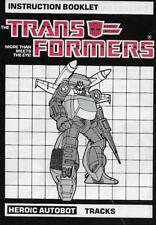 This is a 100% authentic original Blitzwing Decepticon Triple Changer Air to Ground Commando Tech Specs file card from Hasbro's legendary G1 line in 1985! Card is in good C-6 condition with no folds or tears. Truly a piece of toy history! I always combine shipping on multiple items! Transformers G1 VINTAGE 1985 Venom Hasbro Tech Specs File Card C-6 Condition!!!! 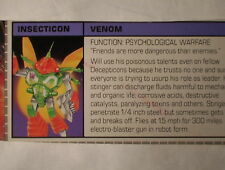 This is a 100% authentic original Venom Insecticon Psychological Warfare Operative Tech Specs file card from Hasbro's legendary G1 line in 1985! Card is in good C-6 condition with no folds or tears. Truly a piece of toy history! I always combine shipping on multiple items! 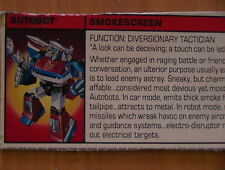 This is a 100% authentic original Smokescreen Autobot Diversionary Tactician Tech Specs file card from Hasbro's legendary G1 line in 1985! Card is in good C-6 condition with no folds or tears. Truly a piece of toy history! Original definition is item is all original parts and has not been repaired. Building the item with spare parts or building the parts with a 3D printer. This is a scrap lot of 2 different 100% authentic original Instruction Booklets from Hasbro's legendary G1 line in 1985-1988! Lot of 2 different incomplete Instruction Booklet scraps in poor C-3 condition with missing panels, folds and tears. Includes scraps for Topspin and Submarauder. Truly a piece of toy history!